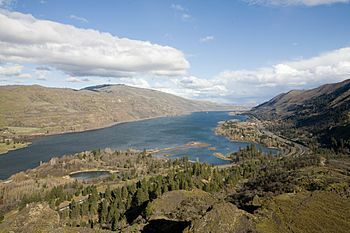 The Columbia River is the largest river in the Pacific Northwest region of North America. It flows northwest and then south into the US state of Washington, then turns west to form most of the border between Washington and the state of Oregon before emptying into the Pacific Ocean. 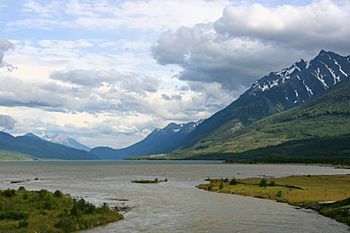 The river is 1,243 miles (2,000 km) long, and its largest tributary is the Snake River. Its drainage basin is roughly the size of France and extends into seven US states and a Canadian province. 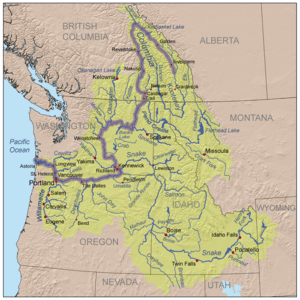 By volume the fourth-largest river in the United States, the Columbia has the greatest flow of any North American river entering the Pacific. The Columbia and its tributaries have been central to the region's culture and economy for thousands of years. They have been used for transportation since ancient times, linking the many cultural groups of the region. The river system hosts many species of anadromous fish, which migrate between freshwater habitats and the saline waters of the Pacific Ocean. These fish—especially the salmon species—provided the core subsistence for native peoples. In the late 18th century, a private American ship became the first non-indigenous vessel to enter the river; it was followed by a British explorer, who navigated past the Oregon Coast Range into the Willamette Valley. In the following decades, fur trading companies used the Columbia as a key transportation route. 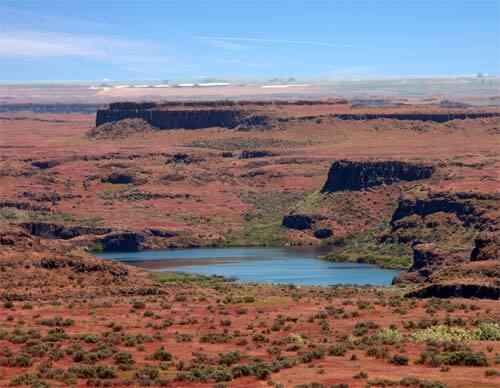 Overland explorers entered the Willamette Valley through the scenic but treacherous Columbia River Gorge, and pioneers began to settle the valley in increasing numbers. Steamships along the river linked communities and facilitated trade; the arrival of railroads in the late 19th century, many running along the river, supplemented these links. Since the late 19th century, public and private sectors have heavily developed the river. To aid ship and barge navigation, locks have been built along the lower Columbia and its tributaries, and dredging has opened, maintained, and enlarged shipping channels. Since the early 20th century, dams have been built across the river for power generation, navigation, irrigation, and flood control. The 14 hydroelectric dams on the Columbia's main stem and many more on its tributaries produce more than 44 percent of total U.S. hydroelectric generation. Production of nuclear power has taken place at two sites along the river. Plutonium for nuclear weapons was produced for decades at the Hanford Site, which is now the most contaminated nuclear site in the US. These developments have greatly altered river environments in the watershed, mainly through industrial pollution and barriers to fish migration. 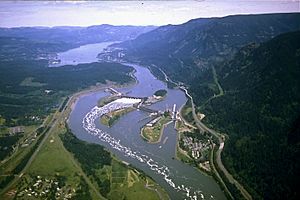 Today the main stem of the Columbia River has 14 dams, of which three are in Canada and 11 in the US. 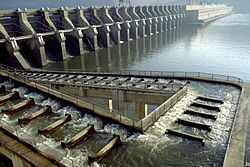 Four main-stem dams and four lower Snake River dams contain navigation locks to allow ship and barge passage from the ocean. The river system as a whole has more than 400 dams for hydroelectricity and irrigation. The dams address a variety of demands, including flood control, navigation, stream flow regulation, storage and delivery of stored waters, reclamation of public lands and Indian reservations, and the generation of hydroelectric power. Columbia River Facts for Kids. Kiddle Encyclopedia.